The Lehigh Valley IronPigs are launching a new and exciting ticket option that gives fans the flexibility to attend any game for a low monthly fee. 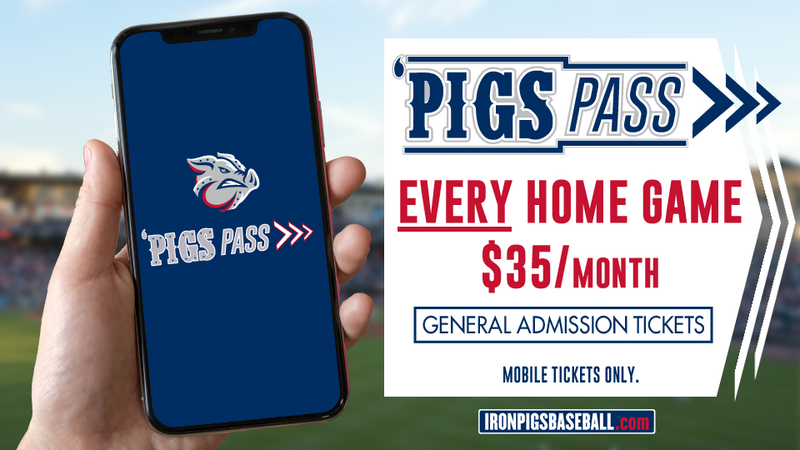 The "Pigs Pass" is now available and grants pass holders access to general admission tickets for every IronPigs home game for just $35 per month during the season (April-August). There's no limit to the number of games a Pigs Pass member can attend. The new Pigs Pass is only available online, and tickets will become available on pass holders' phones before each game. Click here to subscribe to Pigs Pass to begin the 2019 season or visit this page for some Frequently Asked Questions. This convenient ticket option is the latest in an offseason of exciting announcements from Coca-Cola Park. The Lehigh Valley IronPigs have released a pair of 10-game plans - one featuring every 2019 Sunday contest and the other including 10 games vs. Tim Tebow and the Syracuse Mets - as well as a great Bacon, USA lineup of 9-, 17-, 35- and 70-game plans. The Pigs have also announced a collection of theme tickets for celebrity appearances and holiday specials at IronPigsBaseball.com/ThemeNights. The 2019 season will be the IronPigs' 12th season at Coca-Cola Park and their 12th as the top affiliate of the Philadelphia Phillies. This season features the return of the Bacon, USA, membership program, which gives members an unprecedented value in addition to their season tickets. Memberships and group outings are now available. Please call (610) 841-PIGS (7447) for details, or to book your group.